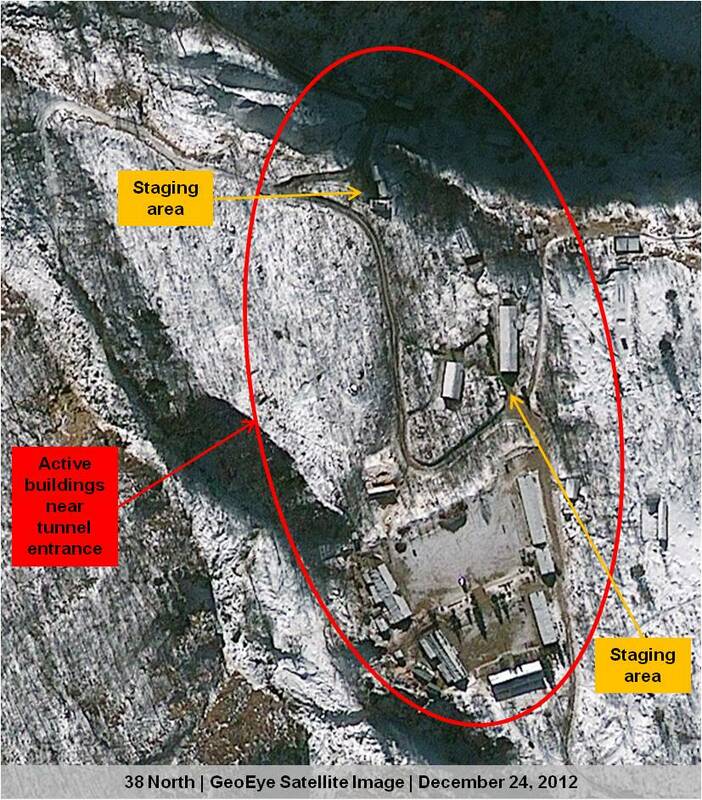 Update on Preparations for a Possible Third Nuclear Test at Punggye-ri: Is a Detonation Imminent? North Korea’s public pronouncements in reaction to a United Nations Security Council Resolution tightening sanctions against Pyongyang have heightened speculation that a nuclear detonation at the Punggye-ri Nuclear Test Facility is imminent. 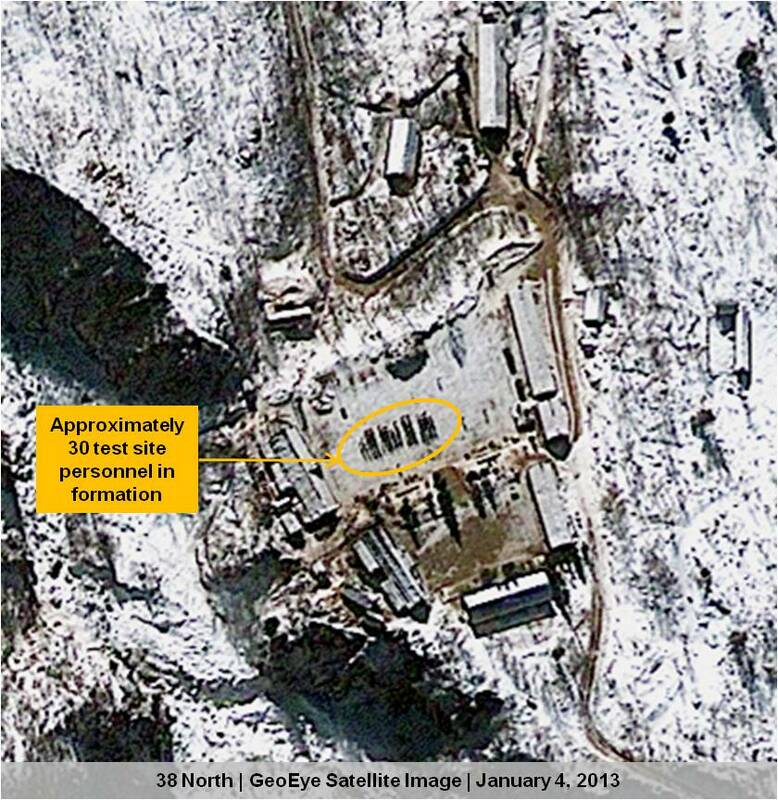 Analysis of new satellite imagery from January 23, 2013 and previous images dating back a month reveal that the site appears to be at a continued state of readiness that would allow the North to move forward with a test in a few weeks or less once the leadership in Pyongyang gives the order. Snowfall and subsequent clearing operations as well as tracks in the snow reveal ongoing activity at buildings and on roadways near the possible test tunnel. A photo from January 4 identifies a group of personnel, possibly troops or security guards, in formation in the yard of the administrative area near the test tunnel entrance, perhaps to greet visiting officials or for some other more routine purpose. 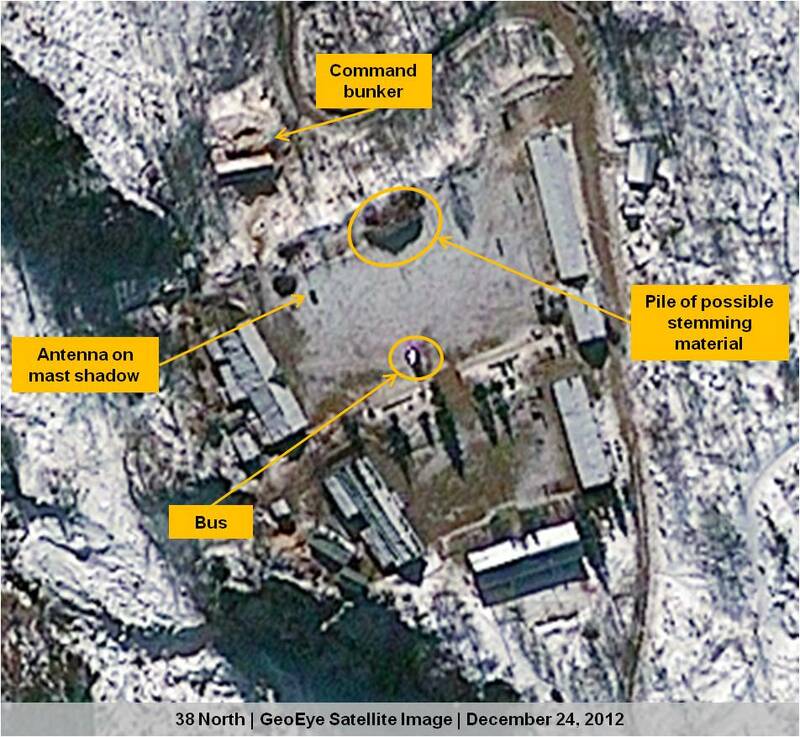 Imagery from December 24 identifies a new pile of material located near the command bunker in the same area. The purpose of this material remains unclear and there are a variety of possible explanations. One is that it is intended for stemming or sealing the tunnel in preparation for a detonation. In a photo from January 23, the size of the pile appears to have diminished. If the material is intended for stemming, that could indicate such an operation may be underway in preparation for a detonation. Satellite imagery reveals continued activity at the area near the possible test tunnel entrance through the appearance of bare ground and open roads. There was significant snowfall in November 2012, and the area has been cleared in the dead of winter, indicating the intent to maintain site readiness. A close-up of a December 24 GeoEye satellite image shows an apparent pile of material in the yard of the main administrative buildings near the entrance to the possible command bunker. (The presence of a bus, probably used to transport personnel working at the site, is another indicator of continued activity.) The purpose of that material remains unclear. One possible explanation is that it is intended for “stemming” or sealing the tunnel in preparation for a detonation. 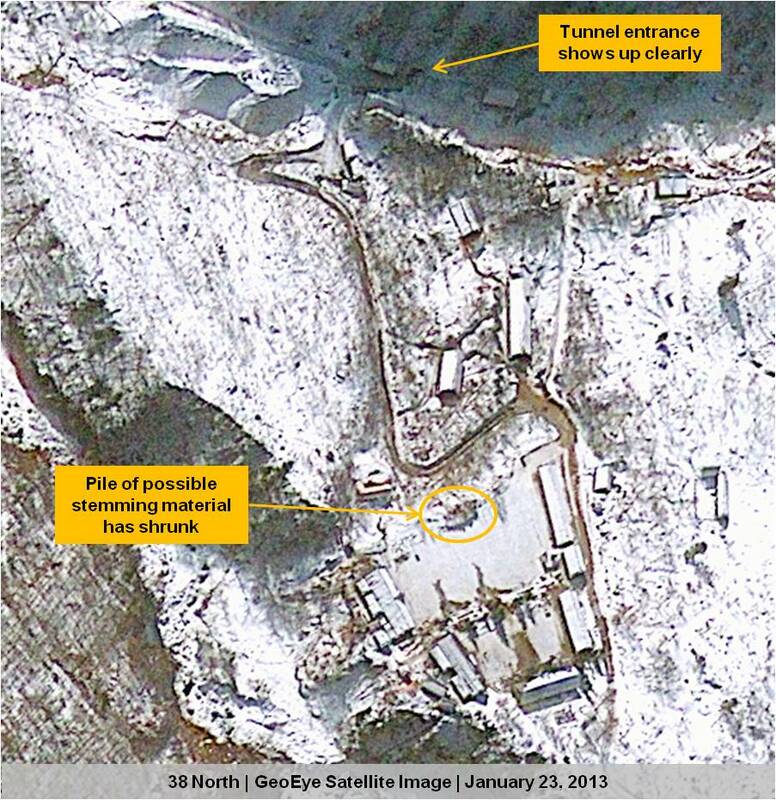 Satellite imagery from January 4, 2013 provides another indicator of continued activity and readiness at the site. Thirty or more personnel, possibly soldiers or security guards, can be seen in formation in the same area. They may be there for special duty, for example to greet visiting officials, or for some other more routine purpose. Finally, satellite imagery from January 23 shows that the pile of material in the yard of the administrative area has shrunk. If this material is intended for stemming, one possible explanation is that operations have begun to seal the test tunnel. This image also provides the clearest view of the tunnel entrance to date. Roads to the entrance continue to remain clear.